That man (or woman) is happiest who chooses a major purpose based on his own thoughts about the world, his abilities, and his desires - a purpose that he reasons will be enjoyable to pursue, that will stretch his abilities and effort in order to achieve it, and that will be meaningful to him once it is achieved. Lesser goals will also be pursued in order to actualize his potential in other realms. He will reward himself along the way by celebrating major and minor achievements and by enjoying immediate pleasures including friendships and romance. He will correct his course and goals based on any new information he discovers along the way. Whether he achieves his goal or is defeated, after a period of celebration or sadness, respectively, he will start this process again and carefully set a new goal or goals. Certain virtues will aid him in his progress and help him to avoid pitfalls in the long term. Having a major goal helps give you clarity, reduces conflicts among goals, and allows for higher levels of achievement. Pursuing your major goal should be both enjoyable and meaningful to you. Establish your major goal looking for that 'just right' level of challenge. As your ability increases, seek higher and higher levels of control over the work you do. Younger people should strongly consider a long-term (career-oriented) approach but the timescale for major goal completion is person/situation specific. It is desirable to actualize goals in other aspects of your life to be more fulfilled. Hobbies and relationships can be part of these other goals and may take on significant important in your life. Money helps you to enjoy your life by giving you greater security, more time to do the things you enjoy, and more options to enjoy. It may also allow you to widen the scope of your business or other activities. Immediate pleasures are an essential day-to-day form of experiencing happiness. Immediate pleasures must feel earned to truly enjoy them. The right balance between work and play should be individualized. Friendships and romantic relationships based on mutual values can contribute immensely to a person's happiness. You cannot easily control whom you will meet in life or the course of close personal relationships. Some very successful businesses and individuals have had to modify their plans significantly. 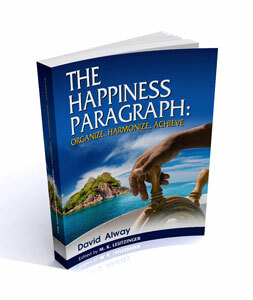 For the best happiness results, you must continue to repeat the outlined process. Certain virtues (Moral Ambition, Rationality, Independence, Honesty, Justice, Integrity, Productiveness) will help you to achieve happiness in the long term.